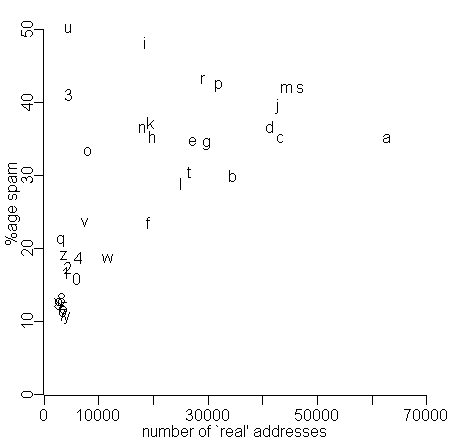 A few days ago I blogged about my paper on email spam volumes — comparing “aardvarks” (email local parts [left of the @] beginning with “A”) with “zebras” (those starting with a “Z”). I observed that provided one considered “real” aardvarks and zebras — addresses that received good email amongst the spam — then aardvarks got 35% spam and zebras a mere 20%. … the point being that the effect I am describing has little to do with Z being at the end of the alphabet, and A at the front, but seems to be connected to the relative rarity of zebras. As you can see from the figure, marmosets and pelicans get around 42% spam (M and P being popular letters for people’s names) and quaggas 21% (there are very few Quentins, just as there are very few Zacks). There are some outliers in the figure: for example “3” relates to spammers failing to parse HTML properly and ending up with “3c” (a < character) at the start of names. However, it isn’t immediately apparent why “unicorns” get quite so much spam, it may just be a quirk of the way that I have assessed “realness”. Doubtless some future research will be able to explain this more fully. u: Java(Script) unicode escape sequence? Yeah, “u” seems to be the real outlier there… curious. The “u” outlier could also be from all the places that allocate “uNNNNNN@domain.com” to “user number NNNNNN”. Universities in particular like to do this.